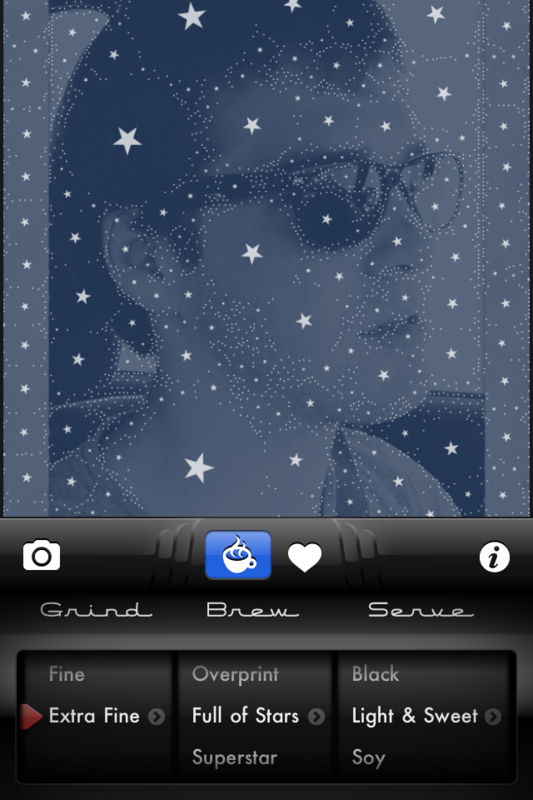 Brewing up a photo mosaic is not a lot different than making yourself a cup of coffee with Tinrocket’s Percolator 2.0 iOS app. Released Tuesday, the latest version of the special effects photo app features iPad compatibility, new effects and filters, finer control over images, and a speed boost. An image created by the author using Percolator 2.0's iPhone app. For those unfamiliar with Percolator, the app uses coffee brewing terminology to let users turn their photos into circle-based mosaics. You can control the Grind (the size of the circles) and Brew (the applied filter) of an image, and then choose the way you want to serve the photo—would you like it Black, Light & Sweet, Soy, or Stirred? The result is a fun, modern looking image that is unlike anything I’ve seen created with other photo apps. 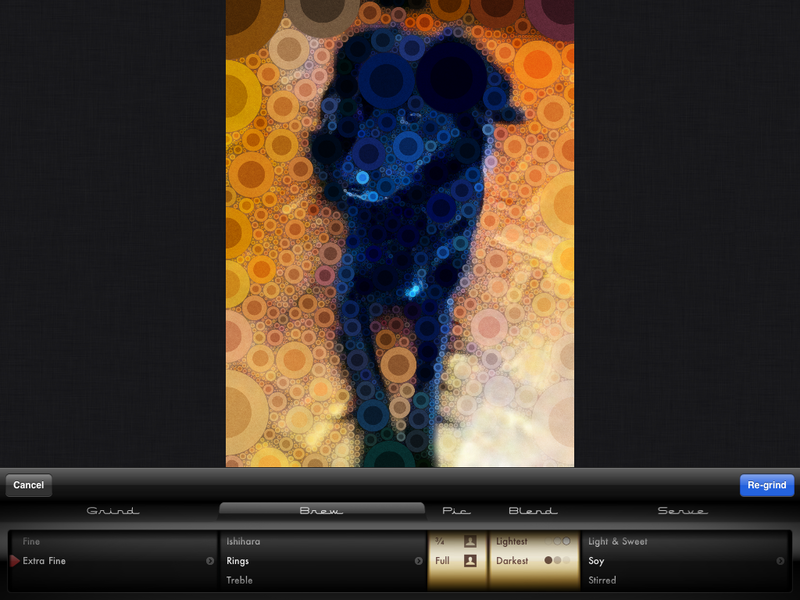 The latest 2.0 update to Percolator adds even more control to the photo editing process. 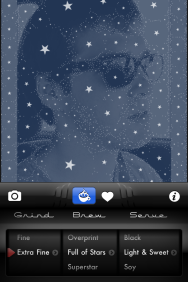 Users can tap on the Grind, Brew, and Serve dials to reveal new hidden dials that allow for increased customization, such as color, texture, detail, and transparency of the filter or photograph used. The app also includes new filters such as Treble, which creates a mosaic with target-like circles, and Superstar, which adds stars across a photo. Percolator 2.0 is now a universal app designed to fit on the larger iPad screen, as well as the iPhone and iPod touch screens. Once you’re finished with a photo, you can share it via Twitter, Facebook, and email—each photo contains metadata with the Grind, Brew, and Serve type used, so if your friends want to recreate an effect, they’ll know exactly what to do. An image created by the author on Percolator 2.0's iPad app. Other new features and fixes include: a shorter, faster processing time for images; more animation when photos are “boiling” and “brewing”; and a redesigned dial-based interface for users to work with their images. Percolator 2.0 is currently on sale in the App Store for $2 (the app costs $3 after the sale). The upgrade is free for anyone with a previous version of Percolator. It requires an iPhone, iPod touch, or iPad running iOS 4.3 or later.